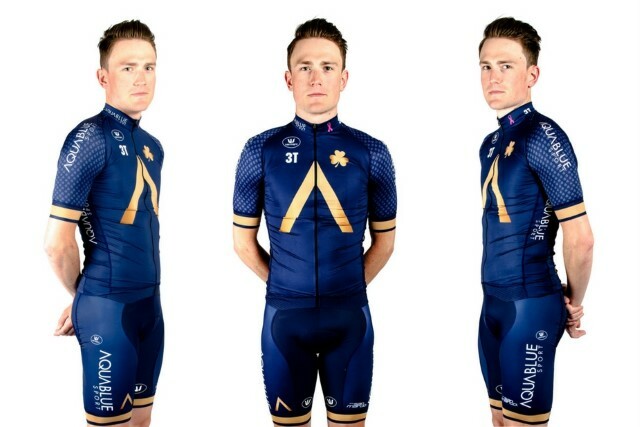 Cork, 13th December 2018: Aqua Blue Sport has revealed its new team kit for the 2018 season, retaining its signature navy blue and gold colour scheme and distinctive front/rear chevrons while adding some subtle updates to reflect new partnerships and further showcase the team’s Irish roots. 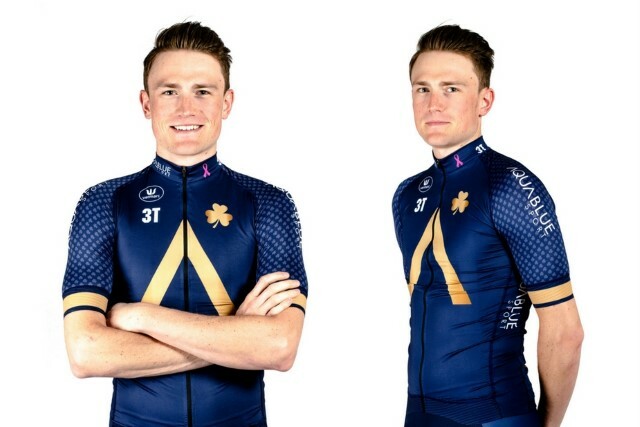 The Irish Professional Continental cycling team has once again partnered with Vermarc Sport for the coming season and will wear the Belgian firm’s flagship Pro Racing Research (PRR) clothing line, designed for the demands of the professional peloton and meeting the highest standards of fit, performance and durability. 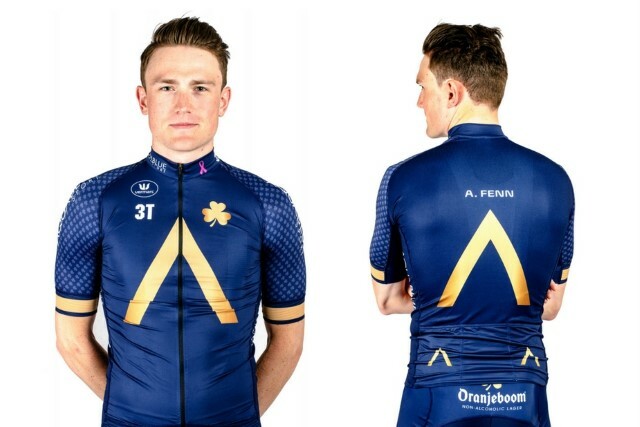 The shamrock, symbolizing the team’s Irish heritage, will continue to feature prominently on the jersey and the bib shorts but has also been incorporated into subtly patterned shoulder and sleeve panels, adding texture and depth to the design. The team’s kit sponsor, Vermarc Sport will feature alongside logos from additional partners including bike sponsor 3T, beverage partner Oranjeboom and saddle provider Selle San Marco. The jersey collar will sport the pink ribbon for breast cancer awareness, a cause that is close to the heart of the team owner, Rick Delaney. 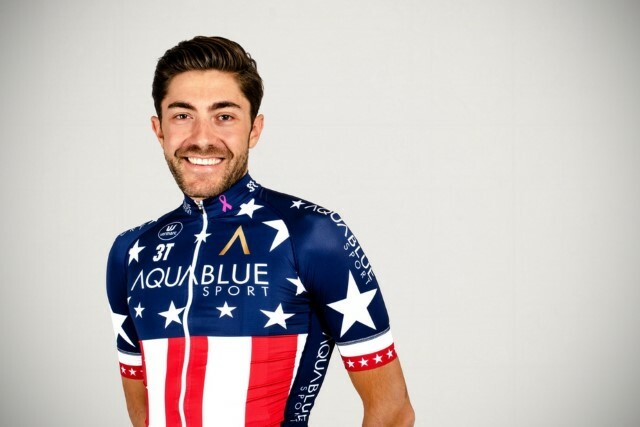 US National road champion Larry Warbasse will sport the stars and stripes personalized kit. Larry Warbasse, as the current US national road champion, will continue to proudly wear the stars and stripes design of the American flag in his personalized kit, which will match his unique 3T bike paint job. 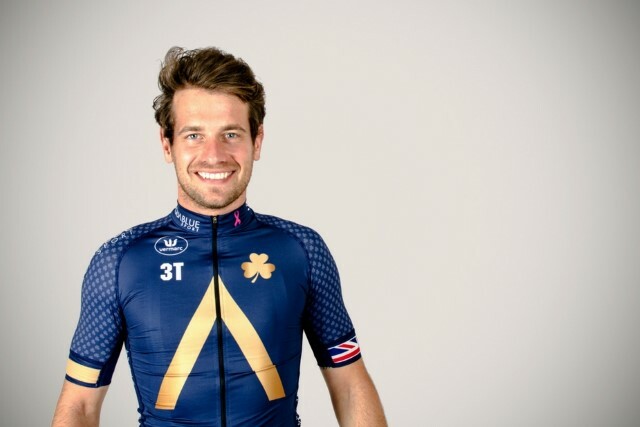 Each rider will also wear a personalized jersey with their name across the back, while Adam Blythe and Matt Brammeier will sport the flag armbands (of the UK and Ireland, respectively) which they have earned as former national champions. Adam Blythe (pictured) and Matt Brammeier will sport flag armbands as former national champions. 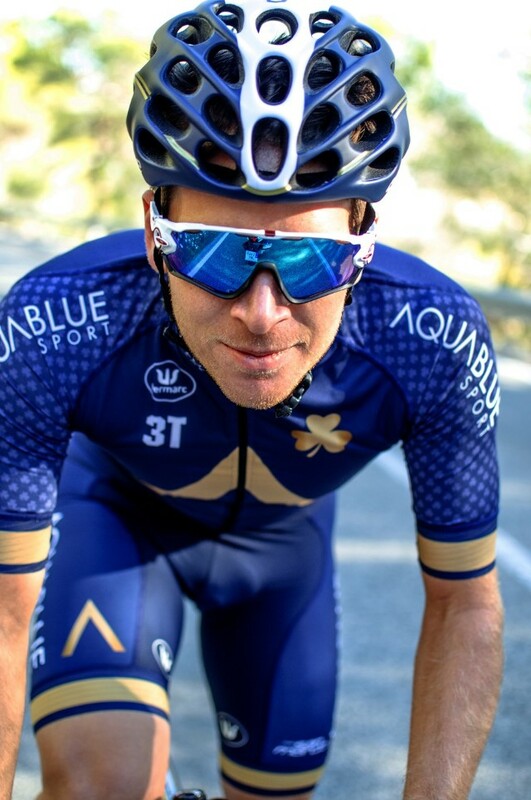 The team will remain focused on their pursuit of excellence and loyal to the colours which have embodied the essence of the Aqua Blue Sport brand worldwide. 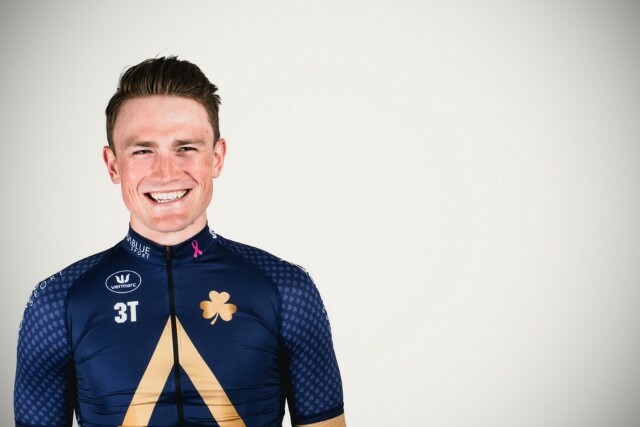 "We've maintained the design elements which our team kit has become known for, such as the royal blue colour scheme, the gold chevron representing our ambition and the shamrock that reflects the Irish spirit. As we lay the foundation for a successful 2018, we want to continue to stand out in the peloton as one of the most stylish, sophisticated and avant-garde jerseys,” said Stephen Moore, team General Manager.